The Dog Stop is a safe, fun, entertaining home-style day care and overnight boarding alternative for your dog — a unique place that will enrich the life of your canine companion. Check Out Our Dog Blog! Features dog pictures, shelter dog success stories, and a variety of recommendations from The Dog Stop. See the Winter Photo Gallery! Dogs and snow. Healthy play is the order of the day at the Dog Stop Doggie Day Care. While you're away at work or on vacation, your canine companion will enjoy a little vacation of her own! Fenced in sandy play yard that's easy on the joints. Heated/air-conditioned indoor play and sleep area. Plenty of dog toys for interactive play. Splashing pool for warm days. Warm and cozy indoor environment for cold days. 24 hour on premise care by experience professionals. Our fenced play yard is full of fun dog toys…soft sand to dig in…and lots of space. 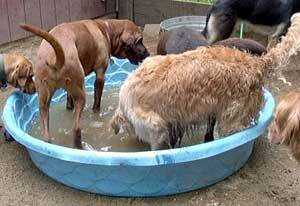 In the summer we have the doggie pool for cooling off. Our "dog house" is an open area that's air-conditioned in the summer and heated in the winter -- it's a great place to sleep at night or to take a break from outdoor play. The Dog Stop is a family run business, meaning that all the family members get involved…humans, canines and cats. We live on premise and the dogs receive 24-hour care.